Post: Gaurav Akrani. Date: 9/12/2010. Comments (4). Label: Banking, India. After independence the Government of India (GOI) adopted planned economic development for the country (India). Accordingly, five year plans came into existence since 1951. This economic planning basically aimed at social ownership of the means of production. However, commercial banks were in the private sector those days. In 1950-51 there were 430 commercial banks. The Government of India had some social objectives of planning. These commercial banks failed helping the government in attaining these objectives. Thus, the government decided to nationalize 14 major commercial banks on 19th July, 1969. All commercial banks with a deposit base over Rs.50 crores were nationalized. It was considered that banks were controlled by business houses and thus failed in catering to the credit needs of poor sections such as cottage industry, village industry, farmers, craft men, etc. 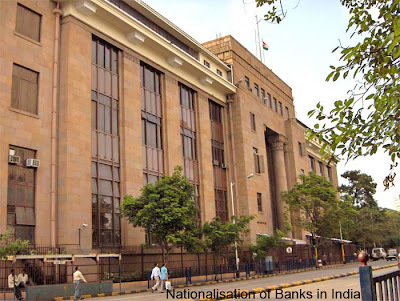 The second dose of nationalisation came in April 1980 when banks were nationalized. The nationalisation of commercial banks took place with an aim to achieve following major objectives. Social Welfare : It was the need of the hour to direct the funds for the needy and required sectors of the indian economy. Sector such as agriculture, small and village industries were in need of funds for their expansion and further economic development. Controlling Private Monopolies : Prior to nationalisation many banks were controlled by private business houses and corporate families. It was necessary to check these monopolies in order to ensure a smooth supply of credit to socially desirable sections. Expansion of Banking : In a large country like India the numbers of banks existing those days were certainly inadequate. It was necessary to spread banking across the country. It could be done through expanding banking network (by opening new bank branches) in the un-banked areas. Priority Sector Lending : In India, the agriculture sector and its allied activities were the largest contributor to the national income. Thus these were labeled as the priority sectors. But unfortunately they were deprived of their due share in the credit. Nationalisation was urgently needed for catering funds to them. Developing Banking Habits : In India more than 70% population used to stay in rural areas. It was necessary to develop the banking habit among such a large population. Though the nationalisation of commercial banks was undertaken with tall objectives, in many senses it failed in attaining them. In fact it converted many of the banking institutions in the loss making entities. The reasons were obvious lethargic working, lack of accountability, lack of profit motive, political interference, etc. Under this backdrop it is necessary to have a critical look to the whole process of nationalisation in the period after bank nationalisation. Inadequate banking facilities : Even though banks have spread across the country; still many parts of the country are unbanked. Especially in the backward states such as the Uttar Pradesh, Madhya Pradesh, Chhattisgarh and north-eastern states of India. Limited resources mobilized and allocated : The resources mobilized after the nationalisation is not sufficient if we consider the needs of the Indian economy. Some times the deposits mobilized are enough but the resource allocation is not as per the expansions. Lowered efficiency and profits : After nationalisation banks went in the government sector. Many times political forces pressurized them. Banking was not done on a professional and ethical grounds. It resulted into lower efficiency and poor profitability of banks. Increased expenditure : Due to huge expansion in a branch network, large staff administrative expenditure, trade union struggle, etc. banks expenditure increased to a dangerous levels. Political and Administrative Inference : Many public sector banks badly suffered due to the political interference. It was seen in arranging loan meals. It ultimately resulted in huge non-performing assets (NPA) of these banks and inefficiency. These are several limitations faced by the banks nationalisation in India. Apart from this there are certain other limitations as well, such as weak infrastructure, poor competitiveness, etc. But after Economic Reform of 1991, the Indian banking industry has entered into the new horizons of competitiveness, efficiency and productivity. It has made Indian banks more vibrant and professional organizations, removing the bad days of bank nationalisation. 19 + SBI + its 5 associates + IDBI = 26. IDBI is a universal bank. And it is no where mentioned that its a nationalised bank. It was set up as part of parliament act 1964 under RBI, but govt took over it in 1979. It does mean that it is not a nationalised bank. SBI and its associates are considered as a single commercial bank. The count will be 20. REPCO Bank Ltd. is a nationalized bank (A Government of India Undertaking).